This is in stark contrast with HTTPS which has encryption, authentication and data integrity from door to door. Because of the revelation of mass surveillance HTTPS usage has risen to 45% but a visit to a website always starts with a DNS lookup. One option to secure the "last mile" is DNSCrypt which offers encryption and authentication. In this post we go through the installation of the reference implementation of DNSCrypt called dnscrypt-proxy. DNSCrypt and HTTPS is not enough to protect your privacy. Nation-state snooping reveals what IP addresses you visit and can easily correlate those with their domain names. On top of that HTTPS SNI sends the domain name in clear text before encrypting the connection. dnscrypt-proxy is available in the Universe repository. If you haven't already enabled the repository then run this command. Install the dnscrypt-proxy package and enable the service so that it will start again after a reboot. Pick one from the list of public DNS Resolvers that support DNSCrypt. The list is also installed from the dnscrypt-proxy package under /usr/share/dnscrypt-proxy/dnscrypt-resolvers.csv. You might want a resolver that is close to home to avoid high latency and one that offers nice terms like no logging and no censorship. Press i to enter Insert mode and add the name of the DNS Resolver you picked (from the first column of the list) to the DNSCRYPT_PROXY_RESOLVER_NAME property. In the same file we see that dnscrypt-proxy is configured to listen to 127.0.2.1:53. We will leave that unchanged. Then press ESC to exit Insert mode and type :wq to write the file and quit. At this point dnscrypt-proxy should resolve all DNS requests sent to it at 127.0.2.1:53. You can test it with the dig command. We are not actually going to use dnscrypt-proxy directly. Instead we front it with the dnsmasq service to add a local cache. We are going to configure dnsmasq to use dnscrypt-proxy as a DNS forwarder. Press i to enter Insert mode. Then uncomment the IGNORE_RESOLVCONF option. Press i to enter Insert mode and add this line to the file. Then restart the dnsmasq service. 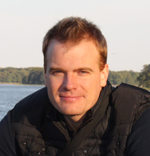 dnsmasq listens to 127.0.0.1:53 by default and we are not going to change that. Any DNS request sent to this address is now forwarded to dnscrypt-proxy. You can test dnsmasq directly with dig. 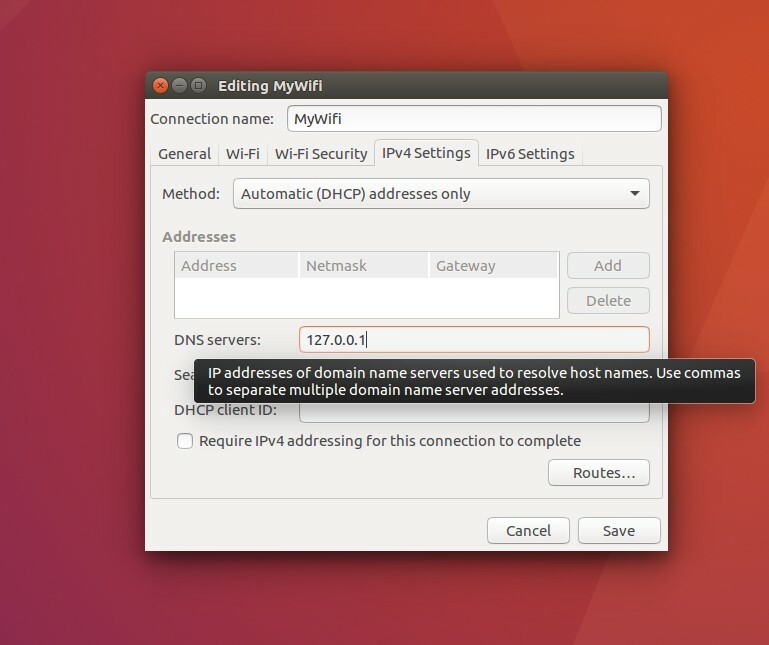 To make all applications use dnsmasq as the domain name resolver, open the network dropdown menu in the top right corner of the Ubuntu desktop. From the menu click "Edit connections...". Select the network connection you are using and click "Edit". Then open the tab named "IPV4 Settings". Under Method select "Automatic (DHCP) addresses only". Under "DNS servers enter "127.0.0.1". Restart the network from the desktop dropdown menu by disconnecting and then reconnecting. Now you should be up and running with dnscrypt-proxy.